Kali Puja is a very important festival for pious Hindus and is performed always during new moon night in the month of Kartik since Kali is associated with dark rites and demon worship; the rituals are austere and filled with great devotion. Kali Puja is an even advanced and terrifying version when compared to Puja Durga since her rites may involve sacrificial killings. If you are conducting Kali Puja for your family and would like to invite your close relatives, then you can use Yoovite.com since it has an excellent online invitation tool by which you can invite anyone you want to the event. The Kali Puja coincides with India Diwali and hence you can plan your guest list accordingly since you will obviously be inviting people for Diwali. The peculiar aspect about festivals of India including Kali Puja is that they seek to destroy evil in the outside world and within us. Kali Puja is hence performed to diminish ego and other negative tendencies that hinder spiritual progress and prosperity. The rituals involved in Kali Puja are simple and plain. You don’t need elaborate cooking or preparation to satisfy Goddess Kali. It is not uncommon to give ‘soma ras’ or pure wine as an offering to Kali. The main puja commences in the midnight and extends till dawn and the Goddess is worshipped amidst the bursting of crackers and display of fireworks. The Puja is a form of spiritual worship with reverence towards Kali through song or prayer. It is said that Goddess Kali liberates souls. Incense invokes spiritual energy and cleanses the place of worship and also enhances the meditative experience during the ritual. Just like Durga Pooja, when you sit, you should be focusing your attention to the idol or the Hindu photos of Kali and also sound your bell or gong. You should also focus on clearing the energy of the chakras and also insist on your guests in doing the same. You and your guests should dip your finger into the oil and anoint the spot between your eyebrows and then meditate on Kali or read the prayer you have in her honor. You will soon feel the healing energy elevate you to a place of higher spiritual consciousness where ego doesn’t exist. 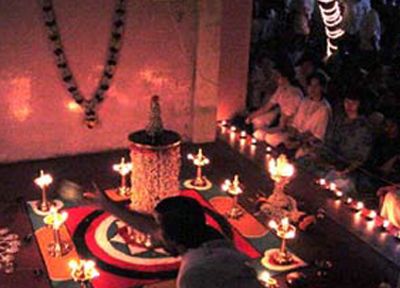 Hiring a pujari is the best way to do everything right in the festivals of India. The pujari must be from a reputed temple and must be knowledgeable. Most old pujaris would try to send their students instead of coming themselves. Youngsters are fine but the older ones are better at performing the rituals due to experience. Serving food is not required in Kali Puja as everything happens past midnight. However, vegetarian breakfast can be served at dawn once the puja is over. Try to avoid non-vegetarian at all costs since it would contaminate the sanctity of the occasion. Also insist the guests not to eat non-vegetarian on the previous day before coming to the Puja.